30 minute Easy Chicken Chickpea Curry. One tasty quick family meal! 30 minute Easy Chicken Chickpea Curry. Add a major flavour boost to this super easy & delicious mid week meal that you can have on the table in no time. This Chicken Chickpea Curry recipe was the result of a bit of a challenge that I set for myself based upon an email I got from a reader asking if I had a really quick chicken curry recipe that didn’t use a lot of hard to find spices, was only mildly spicy and low in fat. Normally my favourite curries take a while to simmer so the quick requirement was my biggest concern but I decided to give it a whirl anyway. There are a couple of Asian markets that I go to in my neighbourhood for curry spices but for this one I decided to only use spices that were easily found in the spice aisle at the supermarket. This one only has 4 spices and probably the least common of those is the Indian spice blend, garam masala. However, the last 4 supermarkets I visited each had this versatile blend in the spice display, so it’s now pretty commonly found. Long story short, even with only a few ingredients and spices, it was terrific. Spouse is not one for hot curries so she was particularly pleased with this one; it’s her new favourite. The kids scarfed theirs down too and were even happy to have the leftovers the next day. I would absolutely recommend making a double batch and plan for leftovers of this tasty, economical meal. Like this Chicken Chickpea Curry recipe? Find more delicious ideas like this one in our Indian Inspired Recipes Category. 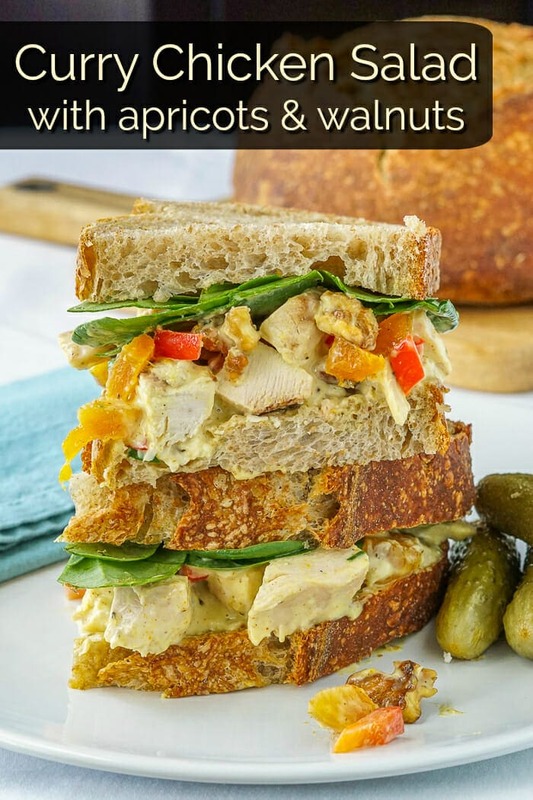 You might also like our recipe for Curry Chicken Salad with Apricots and Walnuts! 30 minute Easy Chicken Chickpea Curry - add a major flavour boost to this super easy & delicious mid week meal that you can have on the table in no time. Heat the peanut oil in a large heavy bottomed dutch oven over medium high heat. Brown the chicken pieces for a few minutes. Remove the chicken from the pot and add the onions and garlic. Cook them for a few minutes until they soften then add the turmeric, yellow curry powder, garam masala and cardamom. Stir them well into the onions and garlic and cook for two minutes, stirring constantly. Return the browned chicken to the pot along with the fresh ginger and and chicken stock. Cover and bring to a slow simmer for 10 minutes. Add the yogurt and chickpeas and simmer slowly for an additional 5 to 10 minutes. Serve over plain basmati rice. I tried to ask this earlier so my apologies if the original comment suddenly shows up 🙂 How do you personally drain the yogurt? I’m getting the ingredients for this tomorrow. I line a colander with coffee filters, add the yogurt and let it sit over a bowl in the fridge for a couple of hours or so. Hope you enjoy the curry.